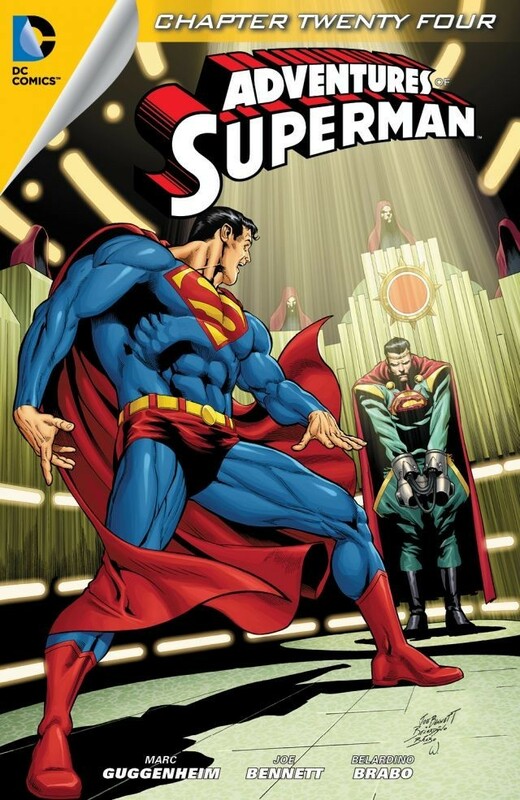 Superman's revelation to his father, Jor-El, sets off a spark in the patriarch. It isn't anger though - it's a program. This whole deal with Krypton was a stratagem designed by a level 11 Intelligence trepan for the purposes of destroying Superman. Who could be so intricate and have the resources to replicate Krypton? None other than Brainiac. In the face of the battle with Brainiac, Superman's powers continue to leave him. The yellow solar energy stored in his cells is nearing depletion. Superman faces certain death from the beating he receives at the hands of Brainiac and the "Kryptonians". 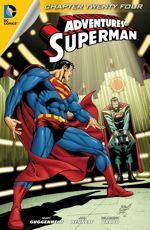 Relying on what he knows of his father, and Brainiac's attention to detail, Superman finds a prototype rocket in his father's laboratory. He makes his escape, but soon discovers why Jor-El abandoned these vessels: they break up in space. Luckily, Superman is near enough to our solar system to feel the rays of its yellow star. Beaming with energy, the Man of Steel zooms back to the bogus Krypton to confront Brainiac. In the heat of their encounter, Brainiac's precision presents itself once more. The events of Krypton's destruction begin rattling the planet. There's nothing Superman can do. He must be idle and witness with shocking realism the final catastrophic moments of Krypton's existence. Flashes and screams and booms - and it's all over. Superman brings Brainiac to the prison planet of Takron-Galtos, then heads for home. For the first time in his life, Superman truly mourns for his lost planet and people. Although the planet he was on wasn't truly Krypton, witnessing its destruction underscored for him the reality of his birth world's fate. The fact of being Krypton's Last Son deeply and terribly sinks in. Story - 3: I was hoping for a huge payoff. It didn't really come, or at least not in the way I was anticipating. Honestly, I thought the villain was going to be Mr. Mxyzptlk. Scratch that. I was hoping it was going to be Mr. Mxyzptlk. This tale had that little rabble-rousing gnome's name written all over it - backwards! I suppose though that a climatic third act is what we're "supposed" to be getting, but I would have preferred a battle of tricks n' wits between Supes and Mxy. Superman witnessing the destruction of "Krypton" while trying to get it all to stop by making Mxyzptlk say his name backwards would have been far more impressive than your garden variety fisticuffs. Just the same, I was so invested in the idea that the villain was Mxy that I was honestly surprised to see that it was Brainiac. I should be thankful for the twist then, I suppose. As for Brainiac, his plot is deviously interesting. To keep Superman emotionally involved on what he believes is his home world, while his cells slowly drain of their power-given properties is good stuff. Brainiac has lured Kal-El into a nearly perfect trap. The only problem I have with this comes later in the issue when Superman attempts escape. He doesn't get very far in the rocket before it explodes. We can see Krypton just behind him, and Rao glowing crimson. Yet, Superman got close enough to our solar system to feel the Sun's solar energy? And it was enough to recharge "every cell in (his) body"? While on Krypton, why didn't Supes just fly out that far once a day, get a top up of energy, and zoom back down? I said in the last review that I had a problem with Superman staying on Krypton for days, recklessly allowing his solar energy to be completely drained. I also said I would forgive this if it's explained that Superman somehow has the ability to measure the amount of energy he has stored, an internal gauge, as it were. It turns out he doesn't. He was surprised to find that he couldn't fly, and was relieved that he "apparently" only had enough energy remaining to survive a long fall*. So, this exemplifies my problem with this whole premise. Superman could have flown out into space now and again to recharge his cells. He didn't. He put himself in danger of not being able to return to Earth. That bugs me in a big way. All in all, this plot was great, but it would have been improved with better thought out details. There are just too many points where there are holes or not enough meat. Now, I have a question: with the explosion of a second Krypton, is there more kryptonite available? Brainiac may have sealed Superman's doom after all! Just a final note. A member commented that I'm incapable of doing these reviews because I'm just a young'un and don't understand the era of "simpler storytelling" that Adventures of Superman is "supposed to be invoking." Well, I appreciate the devaluing of my age, but these stories are not "supposed to be simple." They're just short and constrained by the panel limitations of digital-first titles. No, the tales in Adventures of Superman aren't "simple stories". They're stories, and like all fiction they must be crafted. Whether we like them or not is entirely subjective. *Just a footnote on a beef I have: Superman isn't invulnerable. Invulnerability means "incapable of being wounded, hurt, or damaged." There are no levels of invulnerability. Something is either invulnerable or not. Supes takes damage at full power all the time. He isn't invulnerable. He's just incredibly tough. Art - 4: I took a mark off from the art team this week because of Brainiac. I truly dislike this design. The way his head kind of floats on his chest, the tentacles. I think they were going for creepy, but it just looks silly. The rest of the art looks just as brilliant as it did in the previous two issues.